Many technology service providers tell me they’re experiencing “long sales cycles.” But how long is long? A recent Gartner study of 506 technology buyers indicated that buying teams spend 16.3 months on average to complete a new IT purchase. You might find this fact surprising. Interestingly, buyers find this surprising as well. Seventy-eight percent of respondents said their last technology purchase, from initial idea to contract signing, took longer than they expected it would. Technology service providers, on the other hand, report an average sales cycle of 7.4 months for IT purchases – which suggests that they’re only participating in less than half of the buying cycle. Consistent with this finding, B2B customers in general have completed 57 percent of the purchase process before they interact with a supplier. This means they already have preconceived ideas about what products and features they want to buy and how much they’re willing to pay. In this environment, technology service providers must deliver a purchase experience that transcends product features and benefits to win sales and retain business, or risk becoming irrelevant. What are the buyers doing with all this time? Buyers spend a lot of time developing a common point of view and driving consensus across a diverse team of IT and business participants – buying teams typically comprise of 14 individuals on average. Stakeholders can reside within any function at any level of authority across multiple locations. They bring competing priorities, new perspectives and different criteria for purchasing to a buying decision. Buying teams also perform extensive research across a wide spectrum of sources: colleagues, partners, analysts, external peers and online information from vendors and independent parties. As a result, sales and marketing have a very small time window to influence buyers. Recent Gartner research shows that almost all buying teams revise the project’s business case repeatedly in their buying process, which they may or may not inform service provider about. Repeating tasks delays the buying process further. Business cases are most likely revised repeatedly because of unacceptable cost and risk, the two most frequent objections internally to purchase decisions. These are also the two most time consuming objections to resolve, taking two to three months on average to do so. So what can you do to increase your sales effectiveness given today’s buying behaviour? Avoid using outdated sales expectations and customer communicated intentions to estimate when a deal will close. Instead, evaluate the length of a sales cycle using historical internal data, as well as data from independent research. Lead with business outcome messaging at all stages of the sales cycle. Make sure you articulate what impact your solution will have on the business, beyond a list of features or benefits. proactively prepares a defence against the common objections of cost and risk and facilitates the many approvals required by stakeholders the salesperson isn’t exposed to. Focus sales and marketing efforts at the stakeholders that can drive consensus within a large buying team. The Challenger Sales Model provides specific guidance on how to identify the individuals that will truly help move your deal forward and those that won’t. Use content and sales actions to prevent further delays and help buyers be more efficient. Assist decision making by providing “prescriptive” content and guidance with clear recommendations for all stages in the buying cycle. After all, you have a lot more experience with successful purchases of your solution than your prospects do! Michele Buckley is a research director at Gartner in the technology service provider team. She advises clients how to grow their businesses through go-to-market strategic planning, sales and marketing effectiveness, and competitive messaging and positioning. Creating well-produced, well-written, and interesting content is only the first step in promoting a company’s brand and products. To get the most value out of that content, you need a plan for regularly sharing it with your audience and reminding them that it’s there. The “build it and they will come” approach doesn’t usually work for creative work – no matter how great that blog, video, customer story, or web page is. The most successful businesses keep the conversation going and shine the light on their content by employing several techniques. Ask. Never underestimate how much someone is willing to share what they think of you. Be a lurker. Listen to what people say in online groups and communities, social media, and blogs. You can use this information, to tailor your launches, promotions, and content towards what will resonate with your audience. People are drawn to content that helps, educates, or informs them. They’re drawn to content that provokes thought. They’re drawn to content that makes them laugh. And if they’re drawn to it, they’ll promote it. While creating content that grabs your audience is key, building a community that has your audience regularly consuming and sharing your content is a must. Get social. Social media, whether it’s Twitter, Facebook, LinkedIn, Instagram, Snapchat, etc., allows you to build relationships with your various audiences and generate ongoing interest in the content that you share long after it’s first published. Be creative. Test drive new activities vs. doing the same old thing day in and day out. Try new practices before they’re part of the status quo. Whether it’s using BeLive to bring speakers from different locations to your Facebook page for a live chat or collaborating with a partner company on a first-ever event to showcase your combined products, open your mind to new ways of doing things. Two of our clients took the leap with these examples and increased awareness and engagement with their audiences. Offer incentives. You can keep that interest alive with ongoing incentives that appeal to your target audience while also arousing the interest of new users. Be specific. If it’s not specific, it’s not measurable. When assessing whether the criteria was met, you should be able to answer yes or no. Make it measurable. How will you measure success? What data will you collect? Which tools will you use? Tie it to a business goal. Keep an eye on your competitors’ successes and failures. Content promotion differs from company to company based on culture, voice, and corporate guidelines, but what remains constant is a focus on the audience, a commitment to building community, and measurable goals that align with the project. With these elements in place, you’ll have no problem successfully promoting your products and content. Avery Horzewski helps Aventi clients develop and execute marketing and customer communication strategies. Her projects run the gamut of communication vehicles, from print to Web to social across a wide range of industries. She also regularly speaks about and offers training on social media, and she was a social media program advisor and instructor at San Francisco State’s College of Extended learning, where she taught “Social Media in the Real World” and “Creating Effective Social Media Campaigns.” Contact us today for an introduction. Morissa Schwartz is the Aventi Marketing Manager. She is a doctoral candidate in literature at Drew University and holds a Masters in communication; she uses this education and her marketing experience to allow for seamless communication throughout Aventi Group. Be sure to stay up to date on our social media and blogs for more tips and helpful resources curated by Morissa and the team. 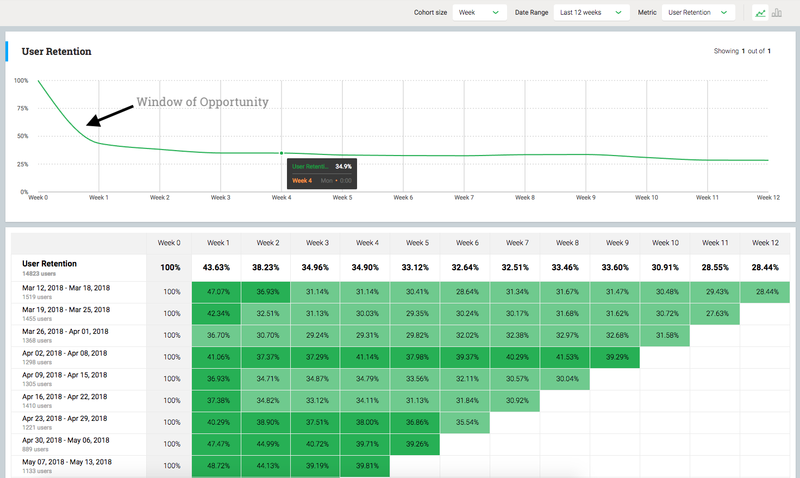 A cohort retention analysis is a helpful tool for product teams to understand how many of their users return to their product and after what period of time. In this article we’ll cover four specific questions you can answer using a cohort retention analysis, “has my product achieved product market fit?”, “what is my window of opportunity to deliver an aha moment to my users?”, “how do I discover product growth opportunities” and “how can I increase my user retention?”. Being able to answer each of these questions is critical to delivering the best customer experience and successful product. Has my product achieved Product Market Fit? When your product has achieved product market fit, your user retention will flatten out over time. If the line trends towards zero, users are not realizing value in your offering and not returning back to your product. This trend line down to 0 is also described as a having leaky bucket. No matter how good your customer acquisition is, ultimately you’re in trouble if you cannot deliver value and keep users coming back. Your ideal user retention graph will look like a smile. This means that over time, you’re giving your users more reason to come back and adopt your product. This can come from introducing new product capabilities that users want and executing specific re-engagement efforts outside of your product to help them realize the value of your product. What is my window of opportunity to deliver an aha moment? To determine the window of time you have to deliver an aha moment to your users, you can look to the slope of the user retention curve. Using the example below you can see that we’ve retained 43% of our users after the first week. The steepness of the curve indicates that it’s within this window of time that we loose the most users. So we’ve got less than 7 days to help users find value in our product. A weekly time frame is a good range for less transactional or business applications. For more consumer apps, you’ll want to measure your cohorts in days. How do I discover product growth opportunities? 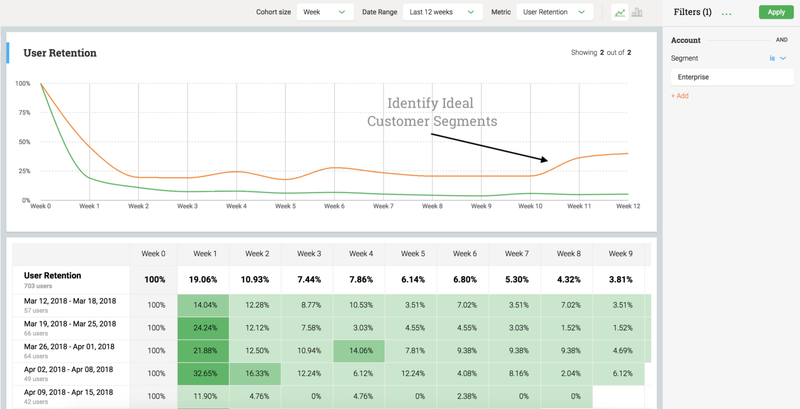 When you have multiple customer segments and/or types of users in your product, you’ll want to review the user retention for each segment as they will have different usage patterns. In the example below, the orange line indicates all users from your Enterprise accounts compared to the green line indicating all other users. The users within Enterprise accounts are retained at a much higher rate and show the increasing engagement over time. How can I increase my user retention? The first step to increasing your retention is to understand who are the users with the best retention rate and what are they doing in your product. Using the detailed cohort analysis below, we can see that users who signed up between April 2nd and April 8th have the highest retention over time. The smile effect in your user retention report is what you strive for. This indicates a thriving customer base that is returning to use your product more and more over time. For all users within this cohort I want to know three things; what features are they using, do they have common characteristics (demo/firmographic) and what was their signup source. With these three characteristics you can gain a complete picture of your ideal user profile & their motivation for using your product. Armed with this information, you now can introduce personalized product experiences to guide all users to adopt the “aha” moments within your product. 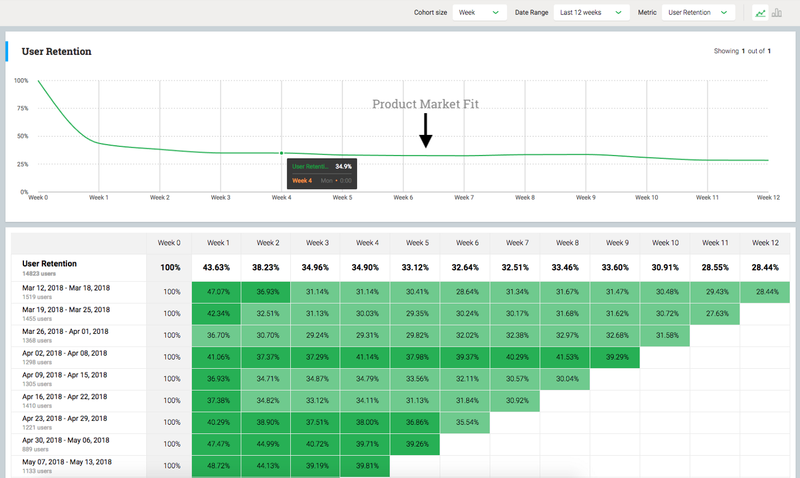 Cohort analysis is one of many product analytics tools available within the Aptrinsic product experience platform. Start analyzing your product experience today with a free trial of Aptrinsic. Robert Frost’s famous poem “The Road Not Taken” is a brilliant cautionary tale about decision-making. The traveler must choose one of two paths that “diverged in a yellow wood,” looking down each as far as possible before finally choosing “the one less traveled by.” The speaker believes this choice makes a major difference in how his future unfolds, since it’s unlikely that he’ll ever have the opportunity to take the other route. Marketers who hope to change their broken processes face a similar choice. Agile marketing is inching toward the mainstream, enticing more and more teams to take their first tentative steps on this exciting path. And very early in their journey, marketers encounter a fork in the road. Will they take an iterative approach to agile, as embodied by the scrum methodology, or will they choose a flow-based approach, commonly known as kanban? It’s not an inconsequential decision, but fortunately we have more data to act on than Frost’s uncertain narrator. Like the paths in the poem, both options are viable. There is no universal right choice when it comes to picking an agile approach. But making an ill-informed decision can still make all the difference, leading to frustration, lost opportunities and possibly even abandonment of agile marketing. Let’s explore both of these common options, so you can pick the right path the first time and look back on the start of your agile journey with pride, not regret. Since the early days of the agile software movement, scrum has enjoyed a high degree of popularity. Recent surveys show that about 58 percent of agile software and IT teams use it, making it by far the most common agile approach. The appeal is easy to understand. Scrum centers on short iterations, or sprints, during which an agile team commits to finishing a set amount of work from their backlog. Once they make that commitment, they’re supposed to be allowed to focus on those tasks to the exclusion of all other work. During the sprint, the team meets every day in a 15-minute daily standup to talk about their progress and discuss removing any roadblocks in their way. By the time the sprint is over, the team should have something suitable for release to their audience or customers. They demonstrate their completed work to others outside the group during a sprint review meeting and then get together as a team one final time during a retrospective meeting to talk about their process and how it might be improved. Then the process starts over with a new sprint. Scrum methodology assumes a particular kind of team exists. The five to nine team members should be cross- functional, meaning most of them could pick up any task from the backlog and start working on it. The team should also be fairly autonomous and self-organizing. is created. This person is the liaison between the team and the business, relaying priorities and strategies from above while protecting the team from unneeded distractions. A second role unique to scrum is the scrum master, who helps the team follow scrum’s recommendations and improve their process steadily over time. As you can see, scrum is very prescriptive. For most teams, it represents a change to nearly everything about how they function. Sometimes that’s good, other times it’s not. Teams who use scrum routinely report massive improvements in productivity and satisfaction, because they’re regularly finishing projects and getting them out the door instead of getting bogged down by interruptions. Marketing teams are particularly prone to emergency requests and unplanned work, so sprints can help us break out of that cycle. However, the strict timeboxes can also create friction for marketers. We often have daily recurring tasks that aren’t necessarily part of a bigger plan but must nonetheless get done. Social media, for example, requires constant attention. How do we fit these things into a sprint? marketing owner is what I typically suggest—but it can still be a bit out of sync with how marketers are accustomed to working. The product owner usually acts as a buffer for the agile team, taking in requests, politely turning them down if they don’t align with the team’s goals, protecting the team from interruptions, and so on. But marketing leaders aren’t used to acting like this. They’re far more comfortable saying “yes” to everything and then figuring out how to get it all done. This role is usually the most difficult one for agile marketing teams to take on. Relatively small teams. Scrum works best on a smaller scale. If you have a team of five to nine people, or could create several teams of that size that are all cross-functional, then scrum could work well for you. Don’t, however, try using scrum within your existing silos. Having a content scrum team and a design scrum team and a social-media scrum team that all try to pass work back and forth will not get you the benefits you’re after and may even create more problems. Cross-functional marketers. You’ll have the most success if you already have people who can do different kinds of work with confidence. Just as handoffs among different teams can create issues, the need to pass work through several different people on the team is likely to introduce stress into your sprints rather than increase productivity. Teams who need protection. If your teams are constantly derailed by last-minute demands or other interruptions from outside of marketing, the protection of a sprint may help them. Being able to put a new request into the backlog for an upcoming iteration is a nice way of saying “no” while still providing good customer service to the person making the request. Of course, this does require a strong marketing owner who’s committed to being a buffer for the team. Teams who can embrace change. Applying scrum isn’t an overnight project. It requires serious changes to how the team plans, how they interact with one another and how they think about their work. If your team is ready for something new, they may wholeheartedly embrace scrum. If they’re already overworked and overwhelmed, they may balk at such a big change. On the continuum of agile approaches, scrum and kanban are at opposite ends of the spectrum. Scrum is highly prescriptive, while kanban is supremely adaptive. Whereas scrum asks a team to follow its practices precisely, kanban is designed to be applied to your current way of working. In other words, you don’t have to change anything about the way you do things now to adopt kanban. Sounds nice, right? The tradeoff is that kanban’s lack of structure requires agile marketing teams to do more critical thinking about their process (and its shortcomings). Here’s how it works. First, sit down and sketch out your workflow, meaning what happens to a piece of work from the time it’s requested to the time you deliver it. This is honesty time. Your workflow should reflect what really happens, not the pretty imaginary picture of what you wish would happen. Then you turn that sketch into a real kanban board, which you’ve probably encountered thanks to the wild popularity of tools like Trello. This board will be the lifeblood of your kanban team, so take a couple of hours to make sure it’s as accurate as possible. Once you have a board, you need to fill it with work. Since kanban works within your current system, you can go ahead and put whatever you’re working on now in the appropriate column. So if you have a blog post planned but not started, it belongs in the defined column. A new email campaign that the team is actively creating would be in progress. This is the simplest version of kanban, and just visualizing your work like this often reveals startling new information about where things are getting stuck and why that’s happening. But we can get even more benefit by adding in two more components of kanban: work item types and work in progress (WIP) limits. After we know what kind of work we’re dealing with, we need to put some boundaries around how much work the team can handle. This is where WIP limits come in. WIP limits are applied to each column of the workflow, and they force the team to complete what they’re currently working on before they can start something new. In this example, we have a WIP limit of five on our in progress column and it’s currently at that limit. That means we can’t start on a sixth project until we finish one and move it into the done column. As you can see, all of these components can be applied to your existing workload without making any changes to how your team gets things done. Then, as you use kanban you can find opportunities for enhancement, unlocking a cycle of continuous improvement that delivers better results and more satisfied team members. Kanban teams manage this process through regular retrospective meetings, just like scrum teams do, and they also have daily standup meetings. Since it’s designed to improve your workflow rather than change it up front, kanban can work for just about any kind of team. Even teams of one can use its principles to improve their effectiveness. But there are situations in marketing where kanban is particularly useful. Teams outside the scrum size range. If your team is particularly small (four or fewer) or particularly large (10 or more), kanban is probably a better fit than scrum. You can certainly make scrum work at those sizes, but the adjustments needed might not be worth the time and effort. Specialized teams. Scrum teams work best if they’re cross- functional, but kanban doesn’t have that requirement. If your team members have specialized skills, or if you rely on third parties (agencies, freelancers or other departments) to complete your work, scrum sprints may just stress you out. Kanban doesn’t stipulate cross-functionality, but it can reveal gaps in the team’s skills that you’d like to fill. Teams inside a skeptical organization. Some organizations love agile, and they’re delighted when marketers want to give it a try. Others need proof before they commit, and for those situations kanban is a good option. Since it doesn’t require a lot of up-front change, kanban lets you get up and running quickly so you can deliver results and prove agile works without doing a big scrum launch. Burned-out teams. It’s far less cumbersome to start using kanban than scrum, so if your team is in desperate need of process improvement but can’t bear the idea of making major changes, kanban is probably a better fit. As you can imagine, this isn’t everything you need to know about either of these methodologies. Take these suggestions as a starting point, and try to look down each path as far as you can see. Keep reading, keep asking questions, and most importantly keep your team involved in the process. It’s an exciting time to be a marketer. We’re forging new ground, and whether you choose kanban or scrum, you’re going to be exploring some new territory. Like Frost’s traveler, given “how way leads on to way,” we won’t be at this crossroads again. Choose wisely, and an amazing agile future awaits.